For artists, “being creative” is central to our identity. Losing that creativity can feel devastating; it really is an identity crisis. In my case, it wasn’t until I became ill, and then started to heal, that I realized my symptoms had stealthily hijacked my creativity. January is National Thyroid Awareness Month and I want to take this opportunity to share my story with you. When researching Hashimoto’s, I found so many articles about body shape and energy levels and diet and hormones and many, many other topics. But I had difficulty finding personal stories about how it affects a creative person. I wrestled for a long time with posting my story before finally concluding that if my experience could help even just one person, it would be worth it. If there’s interest, I’ll consider interviewing other artists/makers with chronic illnesses who are willing to share their experiences and how they keep their creative juices flowing. Especially with autoimmune conditions on the rise, I think more awareness, community and normalization could be beneficial to all. It’s hard to pinpoint when I realized that something was “wrong.” I think it’s like that analogy of the frog in a pot of water that slowly begins to boil: it happens so gradually the little guy doesn’t realize the water is getting hotter and hotter and then all of a sudden, he’s an item on a French menu. I remember I needed naps almost on a daily basis. At the time, I’d written it off as my body being tired due to pushing myself so hard at the gym. Similarly, I’d often wake up with a very ache-y body, and I attributed it to powerlifting soreness. I bore my muscle aches with a sense of pride, as proof of my dedication to my athletic activities. Sometimes the aches reminded me of how I’d feel just before I got the flu: my body felt weak and tender and it required great effort and concentration to lift things and move myself around. Occasionally, my mind would feel exhausted too; it was almost as if I was out of my body and just watching myself go about my tasks, moving slowly, as if through water. (I’ve since learned this is called “brain fog.” Makes sense!) Whenever I’d have days like this, I’d assume I was fighting off a cold or the flu, so I’d rest and do all sorts of preventative measures … and lo and behold, the cold or flu wouldn’t ever come to be! I’d be so proud, thinking my body had fought off a nasty bug! But what I couldn’t just write off was the fact that I’d lost passion for my craft. I’ve been making chainmaille jewelry since 2002 and always thought it would be part of my life. But now, even though part of me wanted to make chainmaille, I was utterly de-motivated to do so. I remember telling my sweetie, “You know, I think I might be depressed,” not because I felt sad, but because I felt apathy, which I know can indicate depression. I wondered if I was still feeling weighed down from closing down my business in Chicago, and the stressful years that preceded it. Was I still burnt out, a year and a half later? It wasn’t just that I wasn’t interested in chainmaille, I wasn’t interested in any creative endeavors. I found myself not wanting to dance, nor create music, nor write, nor make art—all things which I thoroughly enjoyed doing for my entire life. For my job, I was working on a kid’s craft project and maintaining my crafts supplies business, but it was a real struggle to do anything creative on either front. And beyond my jobs, I had zero creative mojo. Before this time period, I was used to having SO many ideas, even if I wrote half of them down, I still would have far more projects in my queue than I’d ever have time to tackle. I’d see weaves and patterns when I closed my eyes to go to sleep. My brain would involuntarily see chainmaille structures underlying nearly every object around me, and a voice in my head would constantly ask, “Oooo, what if I made THAT out of chainmaille?” But now, the voice was eerily silent. I’d lost my spark and I couldn’t shake the feeling that I’d never make beautiful jewelry again. I’ve always identified as a “creative” person, and now that I wasn’t being or feeling creative, it was as though I’d lost a core part of my identity. It felt very foreign and surreal and I wondered how to go about re-defining who I was. Early in 2018, while trying to pinpoint the cause of unrelated chronic pain that plagued me for years, a blood test reveled that I have an autoimmune condition called Hashimoto’s thyroiditis (also known as chronic lymphocytic thyroiditis). With all autoimmune conditions, the body attacks itself. Different autoimmune disorders are defined based on which body parts are being attacked. 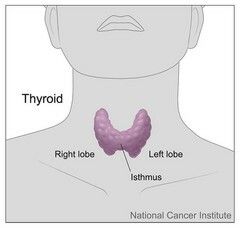 Thyroid illustration by Don Bliss. Courtesy of National Cancer Institute. In the case of Hashimoto’s, the body produces antibodies to attack its own thyroid. Over time, usually many years, those attacks cause the thyroid function to decrease. This leads to a condition called hypothyroidism, which means that the thyroid gland can’t make enough thyroid hormone to keep the body running normally. In the US, Hashimoto’s is the leading cause of hypothyroidism (but note that not everyone who has Hashimoto’s develops hypothyroidism). There is no cure for Hashimoto’s, however, symptoms can usually be managed quite successfully. Medicine boosts your levels of thyroid hormones, allowing your body to operate as though your thyroid were functioning well. Diet, stress-reduction and other lifestyle changes can improve the autoimmune response, reducing inflammation and the production of antibodies so your body isn’t constantly trying to destroy itself. Interesting fact: More than 120 million prescriptions were written in the USA for hypothyroidism medication in 2017 (making it the second-most prescribed medication in the country). Needless to say, if you aren’t taking thyroid medication yourself, there’s a very good chance you know multiple people who are. So what’s the big deal with the thyroid? Well, thyroid hormones affect every cell and all the organs of the body. The thyroid gland, a butterfly-shaped organ located in the base of your neck, releases hormones into the bloodstream so the hormones can reach the body’s cells. These hormones control metabolism—the way your body uses energy. When thyroid hormone levels are too low, the body’s cells can’t get enough thyroid hormone and the body’s processes start slowing down. Common symptoms include: unexplained weight gain, feeling cold, fatigue, dry skin, constipation, forgetfulness/brain fog, and depression. All of a sudden a LOT of things made sense to me: All those naps I needed? The body aches? The inability for me to lose weight? 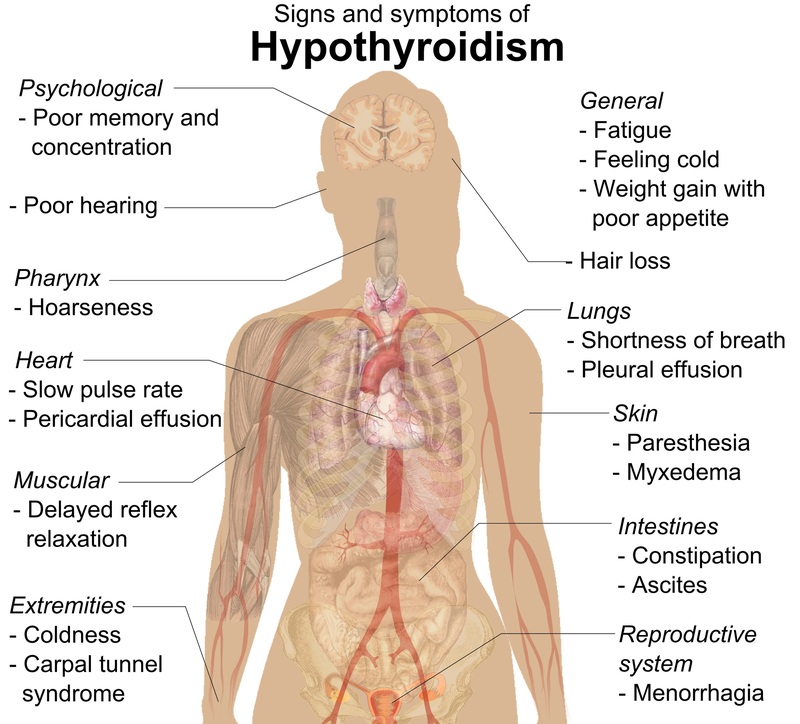 These are all quite common for Hashi’s and hypothyroidism. My bloodwork indicated that my thyroid function was ever-so-slightly below normal, my inflammation markers were above normal, and I was producing both types of thyroid antibodies. Luckily, this was caught in the very early stages, before serious damage was done, and I could begin the healing process. Interestingly, even though I started looking back at the past 6-24 months and realizing how many things I could attribute to Hashi’s, I still hadn’t made a connection between my condition and my lack of creative energy just yet. I was immediately sold on a diet change. For several years, I’d watched as a close friend managed Multiple Sclerosis through a regimen of diet, medication, exercise and meditation. The successful results she had, along with the scientific research she cited, convinced me that diet can be crucial to managing illness. I’m not going to include too many details about my diet, because every person is different and what worked for me may not work for you. (And again, I’m not a medical expert!) Here’s the thing: the foods I had been eating weren’t necessarily unhealthy in and of themselves. But when I took a food sensitivity test, I discovered that I was sensitive to many of the foods I was regularly consuming in large quantities. Even though the foods weren’t bad, they were possibly bad for me, and could be exacerbating my body’s inflammation. I decided to eliminate everything I’d tested sensitive to. (Even though food sensitivity testing isn’t 100% accurate, I felt it would be a good place to start … and also, I’ll be real, there were some items I knew I was sensitive to years ago, but I just kept eating them anyway. Because: CHEESE!) I read that 50-80% of Hashi’s patients feel better by eliminating gluten, and both my doctor and my naturopath mentioned a gluten-free diet. Liking those odds, I decided to go gluten-free, even though I hadn’t tested sensitive to gluten. I cleared my fridge and pantry of all the verboten foods and stocked up with new veggies and proteins. I was already exercising 4-6 days per week, mostly heavy weightlifting. I decided to keep my routine, but promised myself I’d pay better attention to how I was feeling and wouldn’t push myself on days when I felt too tired. It’s hard for someone with an athlete’s mentality to cut back, but I knew I needed to be careful. I started noting which workouts left me overly exhausted versus which ones gave me energy. Finally, I started incorporating meditation back into my life. I’d gone through phases of meditating before, but had stopped meditating sometime after I moved out to California. I think I felt much less stress, and I probably assumed meditation was something I no longer needed. When in fact, the meditation was likely helping me keep my stress levels low! Importantly, though, I had the urge to create again! Slowly but surely, my brain felt like it was “firing” again and within a few months, my brain was flooded with the familiar sensation of nonstop ideas. 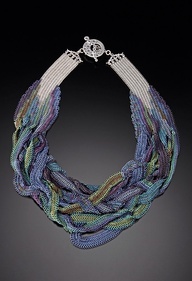 I wanted to sit at my craft table and weave for hours. It was electrifying. So, what’s next now that I have my energy and passion back? Well, first off, self-care is now my number one priority. Autoimmune conditions often travel in packs, and it is quite common for patients to have multiple disorders. So I am taking care of my body and trying to fuel it with proper nutrition, medicine, exercise, and pampering in order to feel as well as I can now and to put myself in the best possible position to manage anything that may come up. Sometimes life happens and I don’t adhere to my diet for a few days, and I wind up having a flare-up (body aches, brain fog, exhaustion). I forgive myself, thank my body for everything it is doing for me, and get right back into my routine. I’m still keeping up the Blue Buddha Boutique Etsy shop, but I have decided to focus my energies on developing my own jewelry line. 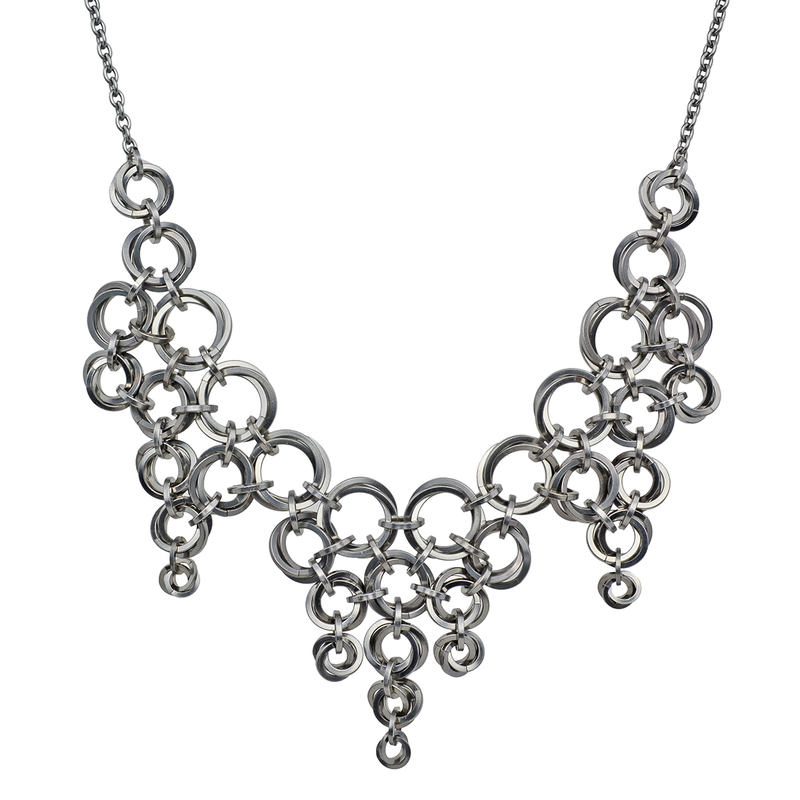 Ever since the early days of my business, my jewelry took a back seat to my other endeavors—running the chainmaille supplies business, writing a book, teaching, developing a line of craft kits for kids. Other than a few years back in 2003-2007, I wasn’t focused on promoting my jewelry and I’d always lamented the fact I kept putting my designs on the back burner. Having lost my creativity made me realize how special and valuable it is to me. This is my chance to give it my all. In the past half year, I finally put together a wholesale catalog and was accepted to vend on Faire. 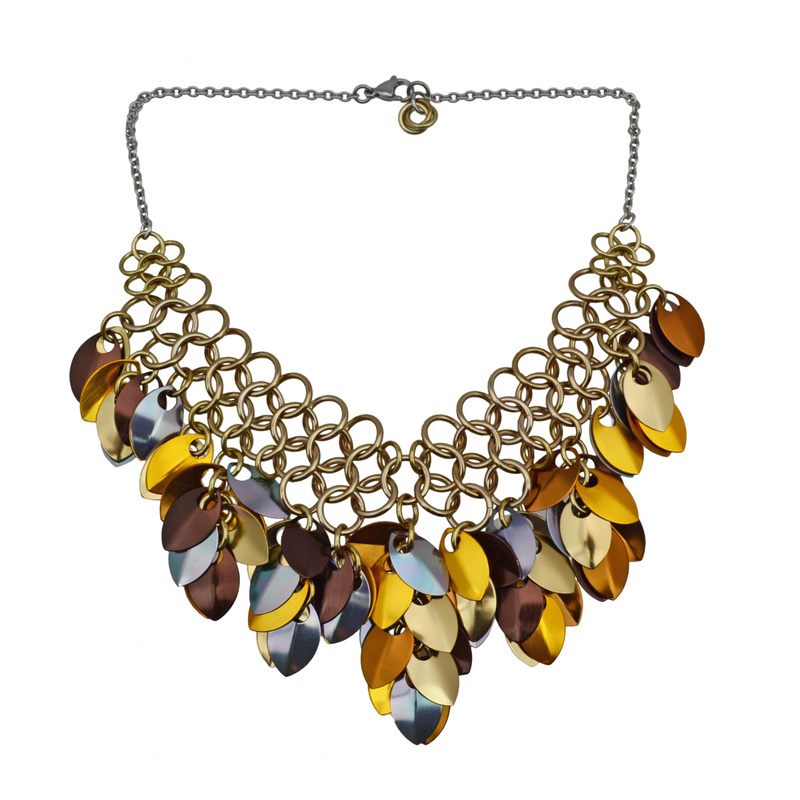 I created an Instagram page for Rebeca Mojica Jewelry and relaunched my jewelry website. I started working on new designs and challenged myself to weave a quilt square in 7 days. I participated in my first art fair in years, and am looking forward to applying to more shows in 2019. I’m grateful to have a wonderful support system of friends, doctors and fellow crafters throughout this journey. Let’s just say I “took the scenic route” the last few years—and I’m sure I’ll find myself meandering down the scenic route again! This scenic route reminded me that many, many people deal with invisible illnesses, and it’s always good to treat all people with compassion, especially strangers. This journey has also caused me to finally embrace self-care in a profoundly deep way, and to feel good, not guilty, when I set boundaries and make time for myself. It’s amazing to feel like me again, and I am excited about what the future holds! Due to my other chronic pain issues, I had already started reading ChronicBabe 101: How to Craft an Incredible Life Beyond Illness by Jenni Grover before I was even diagnosed with Hashi’s. Jenni is a friend who created the Chronic Babe community back in 2005 to help sick chicks all over the world “ROCK their lives.” Her book was immensely helpful to me as I struggled with undiagnosed pain (sidenote: the pain has since been diagnosed and treated!) and the book was even more helpful after I learned I had an autoimmune condition. I can’t recommend this book and her educational resources enough. She’s my #1 Chronic Babe! The American Thyroid Association has a wealth of information on hypothyroidism, Hashimoto’s and other thyroid disorders. ThyroidAwareness.com is another website with a ton of information about thyroid issues. The National Academy of Hypothyroidism has an informational page to help spread awareness of hypothyroidism, along with many other resources on their website. Find out more about the thyroid gland on EndocrineWeb. 3 Comments on "I Lost My Creativity To An Autoimmune Condition. And Then I Got It Back." Aww, thank you so much for taking the time to write, and “hi” *waves* to your granddaughter! I’m so glad she’s enjoying chainmaille. I wish you a very happy and healthy year as well.